It’s Friday, which means another round of shout-outs for a week of great recipes! If you recall for last week‘s inaugural Shout-Out I focused on peaches as a glut of end-of-season stone fruit translated into a vast array of appetizing peach recipes. This week is all about Zucchini (that’s courgettes for the rest of the world). It got in my head last week when I started seeing great recipes like Mission: Food’s Farfalle with Zucchini Sauce, Chef in Disguise’s Zucchini Dip, Kitchen Lab’s Courgette and Pesto Gratin, and Wine Country Cook’s Zucchini Bruschetta. 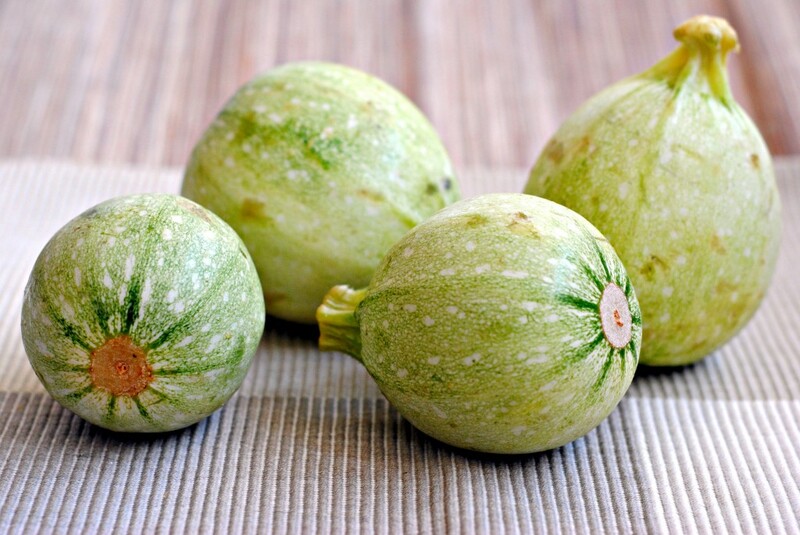 This week continued to be all about zucchini in the food blogosphere. Even I had a zucchini recipe in the form of Round Zucchini Stuffed with Couscous. As these recipes prove, zucchini is unbelievably versatile, showing up in everything from savory to sweet in every which way. I can’t think of a better way to celebrate the end of a great summer than with a mess of zucchini recipes. Enjoy and have a great weekend! In addition to these great zucchini recipes, these are some great food blogs so be sure to stop by and see what other mouth-watering concoctions they’ve cooked up. Eggs, Cream and Honey – It was love at first sight when I saw Heather’s Lemon and Courgette Cupcakes. I adore the flavor combination of lemon and zucchini and baking it into a delicious and pretty cupcake is just genius. Also, as she points out, it’s a great way to sneak some veggies to loved ones if necessary. Gimme Some Oven – I think I have to crown Ali of Gimme Some Oven the Queen of Zucchinis this week. Why? Well, because she just hosted her own self-proclaimed “Zucchini Week” with six zucchini recipes in six days! And each looks better than the last, highlighting yet another incredible use for zucchini. There’s her Zucchini Waffles from last week, a totally tempting Zucchini Parmesan, a seriously sinful Chocolate Zucchini Cake, and – the topper – Zucchini Pizza with Roasted Garlic Sauce. And that’s not all. You’ll have to visit her blog to see what other awesome zucchini recipes she came up with. The Life and Loves of Grumpy’s Honeybunch – Another great blog that has also been on a zucchini roll. Last week she started out strong with a yodel-like Chocolate Zucchini Roll with Spiced Cream Filling and then hit it out of the park this week with Chipotle Cheddar Zucchini Biscuits. You heard that right. Chipotle. Cheddar. Zucchini. Biscuits. Not Derby Pie – Rivka of Not Derby Pie is a close second to winning the title of Zucchini Queen of the week, providing one single, recipe-packed post on creative ways to use up that last of season zucchini. She shows us how to make Zucchini Boats, Zucchini Frittata, and Zucchini Bread – all of which look amazing. What Megan’s Making – I only recently discovered What Megan’s Making and am so happy I did! Meghan’s Zucchini Bacon and Mozzarella Quiche looks ooey, gooey, and absolutely delicious. And despite the mozzarella and bacon it’s been adapted from Cooking Light Magazine so it’s somewhat healthy! Did you make or see any other mouth-watering zucchini recipes this week? What’s your favorite way to savor the last zucchini of summer? Leave a comment and let me know! Lovibg all the zucchini! I have more to play with now and will be checking these out! Thank you! Zucchini is not so common in Malaysia, so I have not cooked them before. I do love my man’s dolma with zucchini and other vegetables. Seeing these delicious zucchini recipes makes me wanna try them all out! I posted a zucchini pie yesterday. It was awesome. It’s that time of year we see some terrific zucchini’s in the store. My favorite recipe is for zucchini bread (make sure to add the pineapple!). Oh man I have to check out your Zucchini Pie! That sounds amazing. Thanks so much for sharing the recipe 🙂 Mmmm I love zucchini bread – but have never tried it with pineapple! Brilliant. These look great except round zucchini are not common at all in Australia and we only get the long ones. That’s too bad! I’ve mostly seen the long ones as well, I only started seeing the round zucchini in Israel. If you get other types of summer squash many of these recipes could probably be made with those. I love your idea of Friday shout-out and it was a very nice choice – zucchini! I love it, but I never tried different kind of zucchini…always the same kind (typical one). I should look for some different ones to enjoy the different shape etc. Good collection of delicious recipes here! Such a great post and I am happy that you led me to your blog! Feed. me. more. zucchini. 😉 I am going to check out all of the blogs you referred to! Thanks I’m so glad you found my blog as well! (likewise!). I agree, can’t get enough zucchini!! Zucchini shoutout! I think this new addition to your blog is a great idea. So many creative ways to prepare zucchini. Thanks Sarah! I read so many blogs in a week and see so many great recipes, and I wanted to share that. Zucchini works especially well since you can go so many different ways with it!